These fantastic and colorful rain boots feature an exclusive sweet caterpillar design. These perfectly high quality shoes are made to last a long time. You will be getting an extrordinary product for an unbeatable price. Our super fun and colorful kids rainboots are perfect for splashing around in puddles. These boots are great at keeping your kiddos' feet dry in the rain and warm. This design will give your child a fantastic look! B A C K to School special 5% coupon! KIDS WILL LOVE TO PLAY AROUND in their exclusive boots. They are super comfortable, soft, lightweight, durable, easy to clean, fast drying and waterproof. Great for Rain, Snow and Spring Time! NEW DESIGN - Featuring a sweet, fruity scent, our boots are made from a new flexible material for high-comfort and best fit. With warm, breathable and removable fleece liners that are fully washable. Wear inserts on cold days. If the day warms up then just slip off the liner and continue enjoying your day. 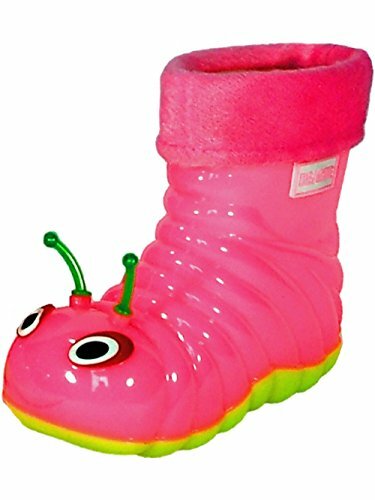 BRIGHT COLORS and VARIOUS SIZES - Which make this boots a unique and adorable gift with a cute caterpillar design that will make these shoes your kids' favorite all day long. IDEAL FOR INDOOR and OUTDOOR USE - Allows them to be functional for everyday use. Our footgear is made to explore. Our FUN and FRESH style is perfect to follow kids' desire to play. SATISFACTION GUARANTEE - If for any reason you don't absolutely adore our product, just send it back our way for a full refund. FREE SHIPPING for qualified online buyers. Order yours now before all are gone!! If you have any questions about this product by Beastie Shoes, contact us by completing and submitting the form below. If you are looking for a specif part number, please include it with your message.